A sculpture commemorates the opening of the first Gateway Bridge in 1986. The original bridge (formerly named the Gateway Bridge) was opened on 11 January 1986 and cost A$92 million to build. The duplicate bridge was opened in May 2010, and cost $350 million. On 16 May 2010 the Queensland Government renamed the Gateway Bridge and its duplicate the Sir Leo Hielscher Bridges. An opinion poll conducted by Brisbane's Channel Nine News, showed 97% of people were against the decision to rename the bridge. Artist Statement : "I`m a formalist ... it`s about geometry. It`s like the Bauhaus dictum, everything in nature can be described by a cone, sphere or cylinder and when reduced to the two dimensional - a triangle, circle or square. I work between these two aspects : it`s what forms part of my visual language. In addition a circle with a diagonal can be seen as a traffic sign, just as the arrow is masculine and the circle is feminine.. in essence I am about the visual language of shapes, lines and colours. 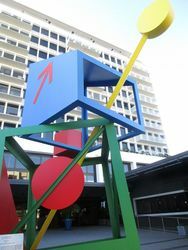 The sculpture was commisioned and built by Transfield (Qld) Pty Ltd, constructors of the first Gateway Bridge, to commemorate its opening in 1986. 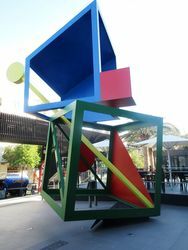 The Red Cube was gifted to the Queensland Government by Transfield, and was installed in the forecourt of the Queensland Museum at Southbank Brisbane until its restoration and relocation to its current site in April 2006.